Regal tangs (Paracanthurus hepatus) are strikingly colored marine fish who are native to the Pacific and Indian oceans. These surgeonfish are hard to miss with their vivid predominantly bright blue physiques. Other common monikers for regal tangs include blue tangs, blue surgeonfish, royal blue tangs and palette tangs. Regal tangs abound in warm parts of the ocean, but they're typically not seen in big clusters. They are prevalent surrounding coral reefs, where they usually spend their time in duos. Regal tangs gravitate toward areas by reefs due to the abundance of nooks and crannies that can serve as retreats. Adult specimens typically get roughly 1 foot long. As omnivores, regal tangs consume a mix of flesh and vegetation, with both algae and plankton as big dietary staples. Regal tangs possess a convenient protective adaptation that helps keep them safe from predation: Their tails and backs are adorned with poisonous spikes. When they encounter predators, they expand the spikes and aggressively pound their bodies back and forth. What happens to the unsuspecting predator usually isn't too pretty -- essentially a bunch of sharp, searing cuts on their bodies. 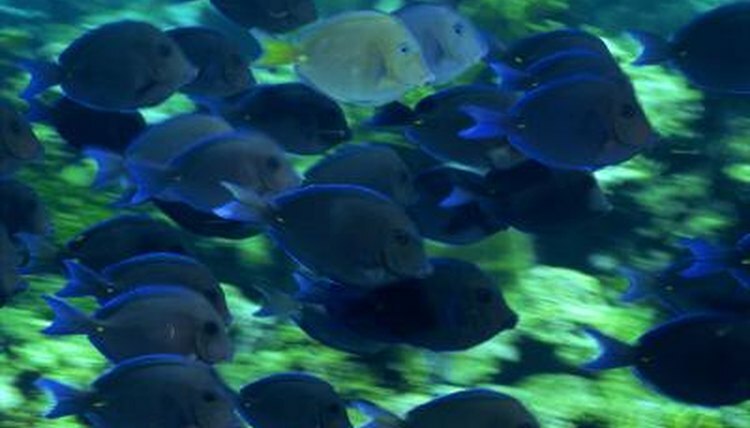 Regal tangs frequently use group work to fend off danger. When predators approach regal tangs, it's not uncommon to spot other members of the species trying to intimidate the bad guys away from their comrades. If you spot a group of these fish moving toward a predator and partaking in their classic spiky display, they're trying to help their fellow regal tangs out. Another handy adaptation that's beneficial for keeping regal tangs alive and well in their habitat involves camouflage. In times of fear, regal tangs are capable of actually rendering their physiques somewhat see-through, allowing them to mix in with their environment. By becoming practically invisible, they're able to evade predators as they pass by, even if they're not too far away from them. Regal tangs' coloration in general often functions as a survival adaptation. Their intense electric-blue, yellow and black elements alert other animals to what they could be getting into -- toxic spikes -- by attacking. Regal tangs' biggest predators include fellow fish such as tiger groupers and tuna. Some of their approaches to dealing with predators are a bit more straightforward than switching color or showing off their ouch-inducing spikes: They frequently hide out amidst corals and in back of stones when in fear mode, particularly when they're young. They also frequently feign death when in the presence of predators, not budging even an inch. Do Pearl Gouramis Need Floating Plants?